Hello. 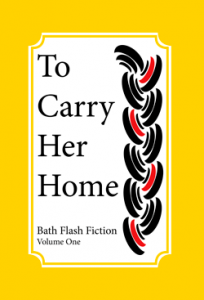 I thought you might be interested in a new anthology, entitled “To carry her home”. My story “Where it is minus forty-four degrees Celsius” is included in this first anthology of the Bath Flash Fiction Award. The limit was 300 words which makes for vivid worlds created in a tiny word count. Mine is one of 145 other stories of the same, or shorter, length. These stories were culled from four rounds of flash fiction competitions run last year. The authors come from 11 different countries, which is impressive. Bath is fast becoming the place for flash fiction. The anthology is available to purchase here. I think the anthology is well worth purchasing – it is something you can dip into for a couple of minutes at a time or you might want to stay in for longer. Charvet, white, 16R in Everyday Fiction. This publication allows for comments and conversation about the story and a rating system too.